The development of cultural policies is not an easy task. Moreover, there are specific kind of policies that become increasingly complicated to develop. Especially when referring to some topics, as intangible cultural heritage, and particularly, the case of Flamenco, given the specific characteristics of these items. 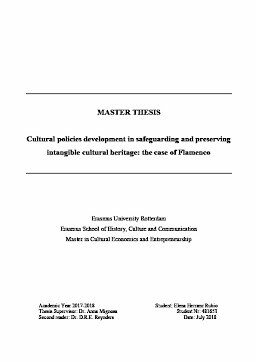 The aim of this thesis is to analyse what is nowadays being done in terms of cultural policies for the safeguarding, preservation and growth of Flamenco and what can be do in the near future. At the same time, the present research strives for serve as starting point for reflection on the Flamenco safeguarding to improve the future cultural policies for Flamenco as intangible cultural heritage. A wide literature has attempted to explain the general characteristics of cultural policies, intangible cultural heritage and Flamenco under the framework of the UNESCO. The analysis has been carried out by asking the people responsible for transmitting it from generation to generation. By conducting interviews with Flamenco community members, this qualitative study attempts to investigate the current situation of Flamenco since in November 2010, it was included in the UNESCO “Representative List of the Intangible Cultural Heritage of Humanity”. But also, the research seeks to analyse the lines of action that the Flamenco community suggests as more convenient in the safeguarding Flamenco.